The long-awaited Google+ debuted to select users Tuesday. The service is Google's latest introduction into the social media soirée as it tries to pull in some of Facebook's 600 million users with new features, clearer privacy guidelines, and intuitive ways to search and share content. Of course, many of those users are already using Google's other services. When you create an account with Google+, you're given the option of uploading your albums from Picasa and your contacts from Gmail. Granted, many of the platform's features are very similar to Facebook's: There are profiles and "friends," a "like" feature called Google +1, a news feed, and messaging. But Google is introducing a couple new features that might be enough to entice Facebook users to switch. These include friend groupings, where a user can set who sees their posts, images, and other content. This is the most significant improvement that Google+ offers over its rivals. Users can also create video chat groups, and follow celebrities or other interesting people, à la Twitter. Finally, users can create pages of interests--similar to personalized Google News pages--that will stream relevant content directly into their social media platform. So what does this all means for businesses? They can look to leverage the platform to communicate with customers and increase awareness. Because the appeal of Google+ is in its targeted sharing options, companies won't be able any longer to blast messaging across the platform through a few well-connected users--often a good strategy on Facebook and Twitter. If Google+ sharing features are an indication of how we actually share and socialize, it points to a trend away from mass messaging across a network. And because Google+ encourages users to build out large networks while also managing a close circle of real friends, the power of these connections will become increasingly important to marketers. That means that having 600 friends or followers won't mean too much anymore. What will be important--for marketers at least--are those contacts you include in your close circle of friends, who regularly share with you, and who expect you to share with them. 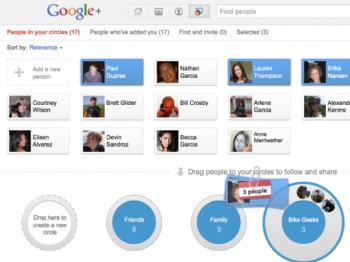 Here's what Google+ friend group sharing options look like. When relationships are no longer defined as simply "friends" or "follows," companies trying to promote themselves will have to adapt. First, because the barrier to going viral on a platform like Google+ is higher, content will have to be more "sticky." No longer will one post assure that all followers see any given piece of content. Second, companies will have to work even harder to build and maintain relationships with their customers. A given company could, for example, maintain a close network of loyalists by offering them deals and freebies, while also reaching out to the broader network to attract new customers and address company issues. Overall, companies will need to begin considering the power and intimacy of a given relationship, not just its size. The Google+ introduction of sharing boundaries is a desirable addition for users, but a potentially huge obstacle for companies. As the first wave of social media forced businesses to become transparent and compelling online, this next wave of relationship relevancy will again push them to take their customers and their relationships more seriously.